Day one of the Avery Dress sew-along has finally arrived!! Today we’ll get all of the prep work out of the way, so we can get the sewing started tomorrow. Are you with me?!? Print the instruction pages on two sides (front and back). For the Avery pattern, these are pages 1-10. I also save ink by not printing the pretty cover and inspiration pages (1, 9-10), but that’s up to you. Print the pattern pages (11-26) on a single side only. Make sure your scaling is set to “none”. 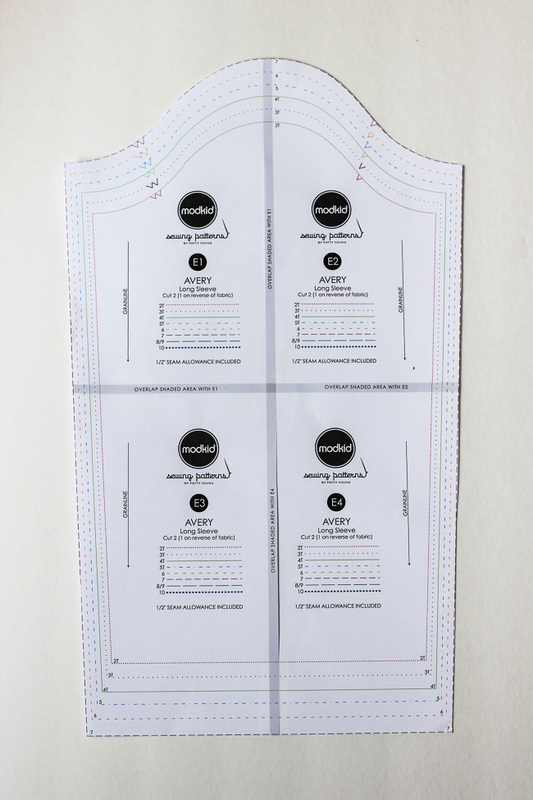 Before you rush off and print all the pattern pages, check the view you intend to sew. Pattern pieces D and E are two different sleeve options. Also note, pattern pieces F and G are optional variations. Don’t print what you don’t need. 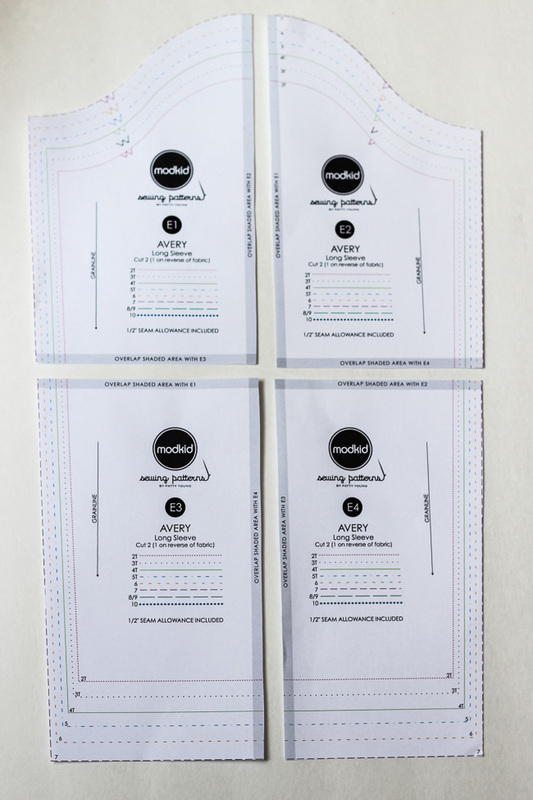 Above all, utilize the test squares to make sure your pattern has printed at the full scale. 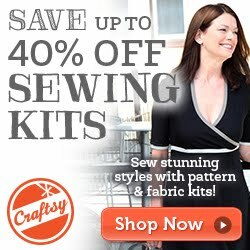 Next, cut all pattern pieces of your desired size. Be sure to include the gray/shaded areas in your cuts. Overlap the shaded areas, as indicated on the pattern pieces, and tape each piece together to form the full pattern pieces. Pattern Piece A – Front Bodice: Cut 4 from fabric #1. Pattern Piece B – Back Bodice: Cut 2 on the fold from fabric #1. Pattern Piece C – Collar: Cut 2 on the fold from fabric #2. View B, Pattern Piece D – Short Sleeve: Cut 2 from fabric #1. View C, Pattern Piece E – Long Sleeve, Cut 2 from fabric #1. Pattern Piece F and G are the optional pocket and belt loop pieces. 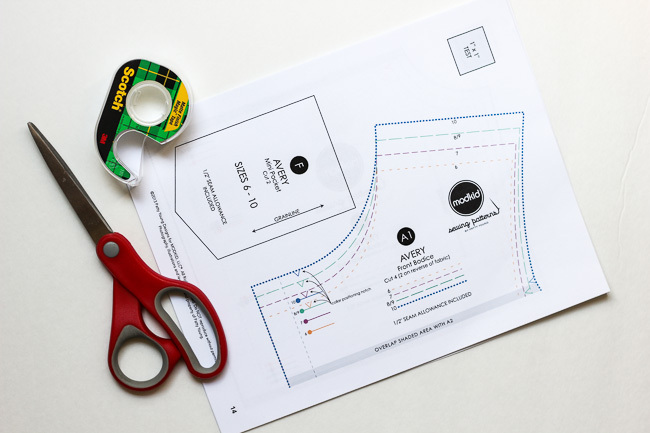 Skirt: See the chart on page 3 for the skirt panel measurements. Cut 2. NOTE: The skirt panel width dimension refers to the full width of the skirt. If cutting fabric on the fold, divide the width measurement in half. 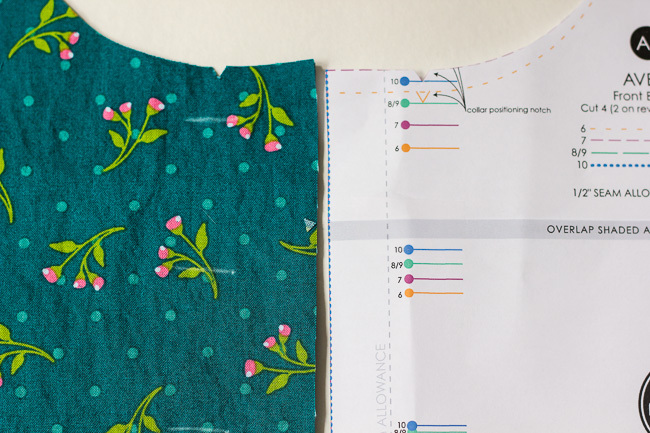 On pattern piece A, you will want to mark the buttonholes and transfer the notches. The buttonholes will be on the left side of the Front Bodice (from the viewer’s point of view). We’d love to see your progress!! Show us your photos in our Flickr group or Facebook group. You can also share photos on Facebook and Instagram tagged #averysewalong.